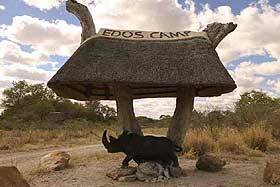 Edo's Camp is located in a charming private Game Conservancy in the Kalahari Area of Central Botswana. The camp is set around a rocky watering hole with its wonderful tents facing the pan. Surrounded by a delightful setting, which the presence of animals drinking at the waterhole in front of the camp make even more outstanding. Edo's Camp can accommodate 8 guests in four large, twin-bedded Meru-style tents. Each tent is provided with a private en-suite bathroom with hot and cold running water. 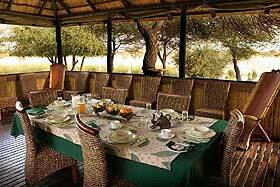 The tents also have their own private veranda with a gorgeous view on the permanent waterhole. Usual voltage is 220-240AC throughout Africa. A 3-prong, round-point adapter will be necessary for appliances that run on 110-120AC. Electricity is completely solar-powered. Lighting is available 24 hours at each tent. Camera batteries can be recharged in the tents. Only small travel hairdryers can be used in the camp. Your daily activities will be planned together with your guide. A special, unforgettable moment will be the visit to the San Bushman Village. You will be personally involved in the everyday habits of the San population, including their typical gathering of food and medicines from the bush. You will enjoy their fascinating ancient, traditional lifestyle - although a little westernised - and you will keep the memory of this cultural experience forever in your soul. One of your most thrilling experiences will be tracking white rhino by foot with your own personal Bushmen Guide. You will follow its footprints silently deep into the bush, until you will be kneeling downwind from a family of prehistoric creatures. Bird-watching excursions will be available as well, on foot or together with adventurous game drives in 4 x 4 vehicles. Game drives with your Guide in open four by four vehicles to spot Gemsboks, Elands, Springboks, Giraffes, Blue Wildebeests, Ostriches, Zebras and many more game typical to the Kalahari Desert. Sunset drives - Extended late afternoon game drives and sundowners when the sun sets in the flaming orange African sky. Exciting night drives (if available) to discover the great variety of game awake in the quiet African night. During the dry season, guests may choose to cool down in the camp's swimming pool, or they may just sit outside and watch an endless procession of thirsty animals going to the permanent waterhole in front of the camp to quench their thirst. Meals, Drinks, and Activities are all included in your stay. Edo's Camp donates a percentage of the nightly rates to a local Day-Care Centre established by the Camp's Owner. Visits to the Day-Care Centre can also be arranged. Rates include: accommodation in deluxe, Meru-style tented camp with en-suite bathrooms, all meals/snacks while staying at the camp, all beverages including bottled water/soft drinks/local alcoholic beverages, all activities while at the camp escorted by professional guides: guided walks, rhino tracking, San village visits, game drives, daily laundry service.